I visited Brisbane for a week this month. My trip was scheduled for work, and I stayed on campus at the University of Queensland. My accommodation was on the pretty lake side, near a bus stop and a bridge that didn't exist when I was a student there 15 years ago. I made the best of them, venturing to my old neighbourhood in West End, meeting up and eating out with friends, family and past colleagues at every available opportunity. The weather was stunning and I clocked up more steps on my phone's pedometer than I have since summer. Here are the seven meals that most delighted me during my stay. 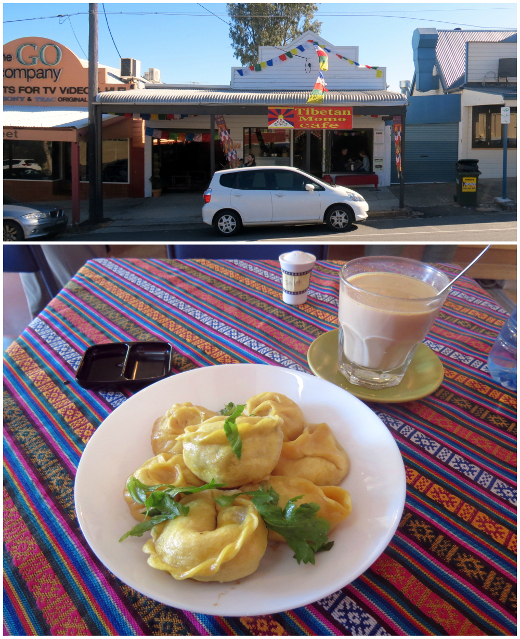 The Tibetan Momo Cafe is less than a month old, and located just around the corner from my first sharehouse in West End. It is a total charmer, with friendly generous hosts just bursting to share their traditional foods with new customers. There's a full vegan menu in addition to the standard meaty one, and they make both flour-based and gluten-free momo doughs on site (they recommend booking ahead for the gluten-free options). I sampled a mix of their vegetarian momos (7 for $15.90), including a gently sweet pumpkin one, a lovely savoury mushroom mix, and an ultra-comfort-carby potato. At my host's recommendation I sampled the vegan version of their Tibetan butter tea ($6) and obediently mixed in lots of salt as I was told Tibetans do. It reminded me, weirdly, of my grandmother's salted butter scones. 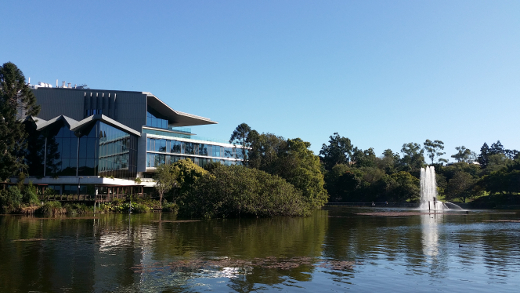 Word is that the Lakeside Cafe (on the far side of the water body in that top pic) does the best lunches on campus. 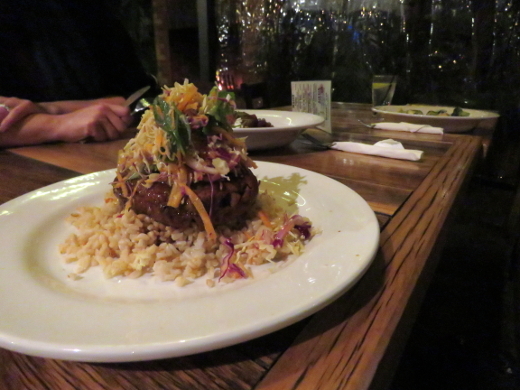 Its menu is short and includes just two veg options, but they are good. 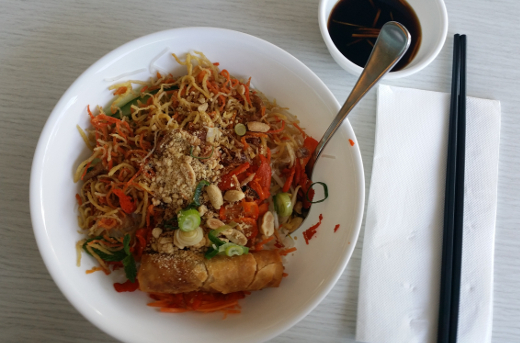 I loved the vegetarian noodle salad ($13) for all its fun trimmings - a spring roll, strips of mock meat, crispy fried shallots and roasted peanuts. The vegetarian rice paper rolls ($7.50) are presumably the gluten-free choice, but check with the staff before ordering. Suki at Southbank is leading the poke bowl craze in Brisbane, and pushing this 'sushi burrito' nonsense too. There's a lot of fish going on, but us vegos can pick tofu as our centring protein. I was pretty disappointed to note that it was uncooked, unseasoned tofu but the ponzu salad dressing I chose had plenty of zest to carry through my salad bowl (~$16). I sprang extra cash for avocado and didn't have a moment's boredom as I nibbled through my radishes, carrots and edamame. Three days into my trip I was already starved for fresh veges! 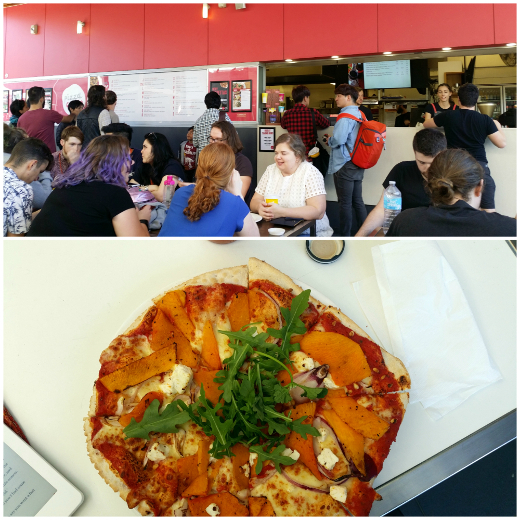 Visiting the Pizza Caffe at UQ brings the pleasure and pain of nostalgia, as it has outlasted the Schonell Cinema that it originally served. Their menu runs through the alphabet with many pizzas named after cinematic greats; I ordered the Zurlini ($15) and picked off the onions, while enjoying the sprawling pumpkin slices, feta bursts and pine nuts. I only wish I'd noticed their new smaller, cheaper pizzettas. As it was the staff and the pigeons squabbled over who could take my leftover slices when I got up to leave. 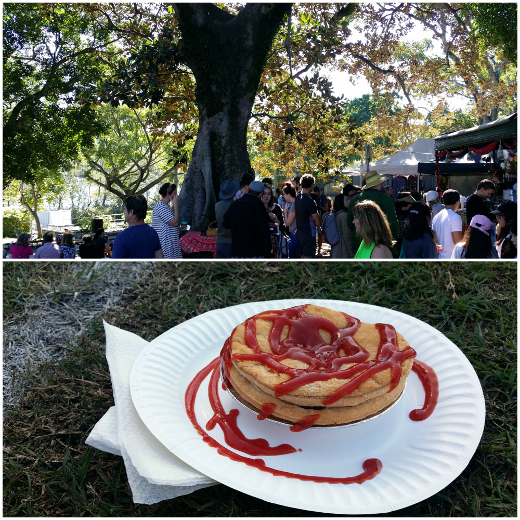 The Davies Park Markets are another fond favourite from my years as a local. I looked longingly at the fresh produce, skipped past the faith healers, admired some beautiful, hand-made cotton clothes, lingered over the second-hand jewellery, and tasted the grain-free seedy crackers. I could barely believe that the Ykillamoocow team still have a stall, selling vegan dagwood dogs (! ), pies, and samosas. A no-bull pie ($5) was the only thing I pulled my wallet out for all morning; I ate it sitting on the edge of the sports field and spilled tomato sauce all down my dress (no regrets). The Burrow has been displaced by an enormous development since our last visit. It now inhabits an old Queenslander home that lends it a relaxed, sub-tropical atmosphere even mid-winter. Beyond breakfast, the menu's all pizzas, fries and burgers with a couple of token salads. Michael dug into a vegan Sausage Scandal Dawg ($18) generously stuffed with sauteed sausage chunks, capsicum, onions and mushrooms plus relish, lettuce and mustard. 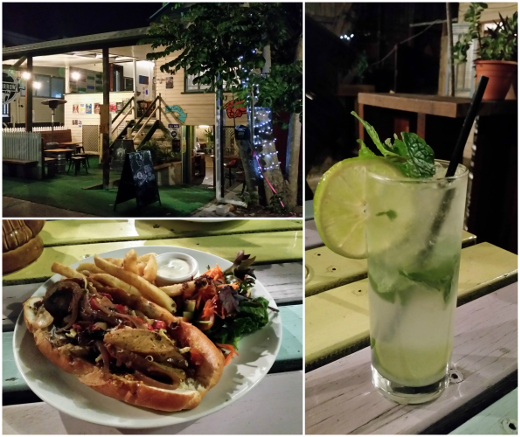 I was mostly just in the mood for a mojito ($18), but picked at the beer battered chips and a fattoush salad we'd ordered to share across the table. Lokal + Co is another eatery within an old Queenslander residence. Where the Burrow around the corner is rambling and casual, L+C is all reserved white walls and spartan Scandinavian design. We would gladly have picked three dishes each from the menu and were roundly satisfied by the ones we settled on: for Michael, De-Puy spiced lentils, roasted cauliflower, braised silverbeet, coconut sambol & taro crisps ($20) and for me, an apple pie waffle served with hung cinnamon sour cream, braised apple and toffee crunch ($19). It was a strange sensation to walk down that same street and check in on the first apartment Michael and I rented together - a time before food blogging, when we rented DVDs from Trash Video and relied on a meagre dial-up internet quota supplied through my UQ enrollment. In my sun-drenched week, I eagerly found both comfort in the old and plenty of positives in the new. 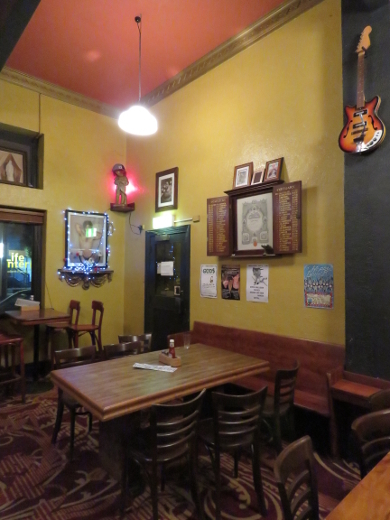 Our mate Kate recently suggested The Yarra Hotel as a potential venue for our book club. The two factors in its favour are that this pub has half-price vegetarian meals every Monday and Tuesday night, and room for dogs in the beer garden. We figured we'd best test the food and pooch space before our next club meeting. The menu has abundant veg*n and gluten-free options, all pretty well labelled; the veg dishes are often matching pairs to more traditional meaty ones. It's hearty fare: six kinds of burger (with a veg patty that can be subbed into any one), parmas (chicken or eggplant), ribs (pork or vegan mock), toad-in-the-hole (beef or veg sausages). 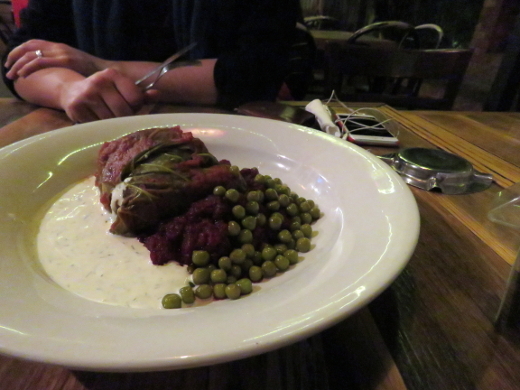 Kate was excited to see Hungarian-style cabbage rolls ($11) on the menu. The vegan version is stuffed with mushrooms, then served with pickled peas, dill sour cream, and a beetroot puree that was most unexpected and most appreciated by Kate. Michael took on the vegan hoisin ribs ($12), a thick and flavoursome wodge of mock meat served on chilli-ginger brown rice and topped with Asian slaw. It's a well-balanced, filling meal. I steadily polished off a plate of house-made gnocchi ($11) with broccoli, almonds, zucchini ribbons and Grana Padano, picking out the slices of red chilli. 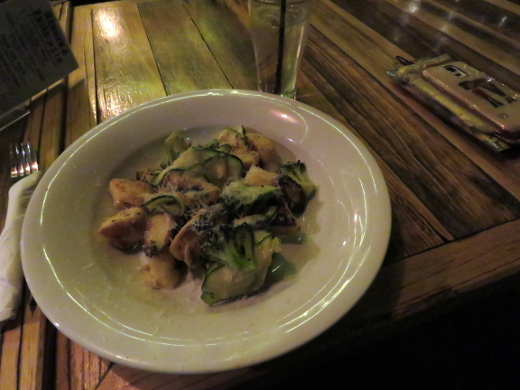 The gnocchi were soft, with the odd golden-seared edge; terrific. 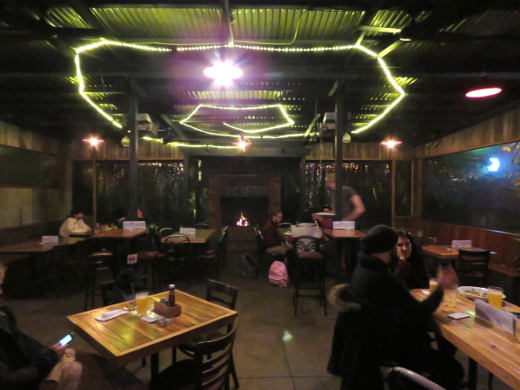 The beer garden is well heated and our companion dog made a few friends while we ate. Our meals were great, outrageously good value at early-week half-price, and worth their standard price too. We can see a good few cozy book club nights ahead at the Yarra Hotel. Fellow bloggers ParmaDaze didn't care for the parmas they ordered at the Yarra Hotel three years ago. I've had these chocolate & sesame yo-yos from Ottolenghi's Guardian column bookmarked for 18 months, just waiting for the seasons and our Ottolenghi club dates to align. They come under the apt heading Rich pickings, sandwiching biscuits dense with chocolate and sesame seeds with layers of chocolate ganache and tahini cheesecake spread. Unfortunately, the instructions weren't quite what I needed to get the job done, and I've adjusted my instructions to reflect what's more workable in my kitchen. For example, the ambient heat from the boiled cream wasn't enough to melt all of the chocolate and butter in my ganache, and I had to set up a makeshift double boiler. The rest of my butter was too firm for hand-beating, yet the biscuit dough was too soft for rolling! What is the temperature in Ottolenghi's test kitchen, I wonder? In retrospect, I reckon it's worth refrigerating the biscuit dough before forming the cookies. They spread a lot during their brief 6-minute bake, and my irregularly-spooned ones were especially delicate and crumbly around the edges. A lot of care and a few under-the-breath curses were used as I spread them with the thick ganache and flavoured mascarpone. The finished biscuits were generously proportioned, rich and sweet; a grand final flourish best served with a cup of tea. For future chocolate-sesame desserts, though, I'm more likely to go back to another cookie recipe I posted about a few years ago. It's a good deal less fussy to bake, and I'm sure it'd make cute sandwiches, too, with some sweetened cream cheese in the centre. A house-keeping note: as a result of Photobucket changing its terms of service this week, our 1500+ posts from 2006 through to August 2012 are currently lacking photos! We're looking into alternative hosts for these pictures, and we'd welcome your recommendations in the comments. Make the ganache first. Chop the chocolate. Set up a double boiler with boiling water in the first layer (I just use two carefully stacked ordinary saucepans). Place the chocolate, butter and cream in the top pan and cook gently, stirring until everything is melted. Turn off the heat, and remove the top pan; give it a few more vigorous stirs, then let it set at room temperature. Cover the surface of the ganache with plastic wrap and set aside. Next, start preparing the cookies. Gently toast the sesame seeds in an unoiled pan until golden and fragrant. Set them aside to cool. Gently melt the chocolate in a double boiler, and set it aside to cool. In a small-medium bowl, sift together the flour, baking powder and cocoa. Stir in the cooled sesame seeds and salt. Set aside these dry ingredients. In a medium-large bowl, beat together the butter and sugar. Beat in the egg and vanilla. Beat in the cooled melted chocolate. Gently beat in the dry ingredients. Cover and refrigerate the dough until firm, at least a couple of hours. Heat an oven to 180°C. Line two baking trays with paper and spray them lightly with oil. Retrieve the cookie dough from the fridge and roll it into 2cm-diameter balls. Place the balls on the baking tray, leaving lots of space around them (perhaps 7cm each way?) for expansion. Bake the cookies for 6 minutes, until just cooked. Let them cool on the tray for 5 minutes, then transfer them to a rack to cool down to room temperature. In a small bowl, beat together all of the cream cheese filling ingredients until smooth. Time for assembly! Sort through the cookies and pair them up so that their sizes and shapes match as best they can. Spread the ganache on one of each pair, and the cream cheese filling on the other of the pair; gently smush them together. Serve!